The Munich Philharmonic Orchestra and Sergiu Celibidache share an exceptional legacy. He started his work as principal conductor in 1979 and remained in his post for 17 years. 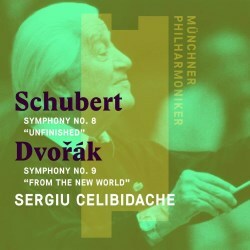 Celibidache played an integral part in developing the Munich Philharmonic into an orchestra of worldwide renown. The orchestra itself has launched its own label, which means that many of the concerts from its huge archive will be made accessible to the general public. As an overall conception, the Schubert is slow and massive but is also packed with small nudges and lovely interpretative touches. The great cello melody in the first movement is played very gently, beautifully supported by equally gentle comments from the woodwinds. There is no exposition repeat. Climaxes are broad and overwhelming with some marvellously deep and sonorous string playing. The second movement is really slow but the woodwind solos set against the gently rocking string accompaniments take the breath away. Once you can adjust to the tempo the actual phrasing and balance are exceptional but it won’t be to all tastes. I personally enjoy Celibidache’s way with the symphony because he gives the music time to breathe and there is always special attention given to dynamics. Give it a try and you too could soon be converted. It’s an involving experience and his orchestra is impeccable. The Dvorak is pompous and grand. Some will find it controversial but it really is thrilling and big boned but admittedly slow. The forte passage at the opening of the first movement blows you away. The depth of string tone is the key and very imposing it is too. Celibidache is then able to give the famous flute solo a lovely lyrical character leading up to another shattering climax. The movement ends in a blaze of glory – horns, trombones and trumpets sing out and the strings continue to deliver some lustrous playing. For some reason the exposition repeat is ignored. The Largo runs for an incredible 17 minutes but it is hugely impressive. The level of concentration and beauty of tone is remarkable. The lovely music making is almost trance-like and it’s hard not to get totally drawn into and fully involved in the experience. No other recording that I know is anything like this but it may not be to everybody’s taste. The sense of a live performance taking place in front of you is uncanny. The Molto vivace is an unusual reading with a slow tempo delivered in a somewhat dramatic and hard driven way. However, the more gentle passages give the woodwind players further opportunity to display their teamwork and interplay and Celibidache gives them time to make the music sing. The closing Allegro con fuoco is the least controversial movement in terms of tempo but Celibidache has an uncanny knack of delivering moments of real stillness at key moments followed by hair raising full blooded tutti passages. I fully understand why some listeners are turned off by Celibidache’s often wayward approach, especially with his slow tempi. There are also many positives to his approach and this disc is a good example of his supreme musicianship. With world class playing and the palpable excitement of a live concert this is a great CD. The audience is silent and the orchestral recording is ‘full fat’ and preferable in many ways to many modern digital recordings with their clear but starved string tone. I will stick my neck out now and say that this is one of the great recordings of the New World.